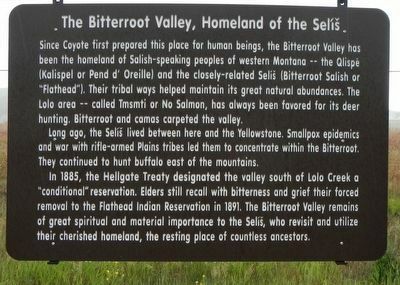 Since Coyote first prepared this place for human beings, the Bitterroot Valley has been the homeland of the Salish-speaking peoples of western Montana -- the Qlispé (Kalispel or Pend d'Orielle) and the closely- related Selíš (Bitterroot Salish or "Flathead"). Their tribal ways helped maintain its great abundances. The Lolo area - called Tsmsmti, or No Salmon, has alway been favored for its deer hunting. Bitterroot and camas carpeted the valley. Long ago, the Selíš lived between here and the Yellowstone. Smallpox epidemics and war with rifle-armed Plains tribes led them to concentrate within the Bitterroot. They continued to hunt buffalo east of the mountains. In 1885, the Hellgate Treaty designated the valley south of Lolo Creek a "conditional' reservation. Elders still recall with bitterness and grief their forced removal to the Flathead Indian Reservation in 1891. The Bitterroot Valley remains of great spiritual and material importance to the Selíš, who revisit and utilize their cherished homeland, the resting place of countless ancestors. Erected by Montana Department of Transportation. 46° 44.516′ N, 114° 4.88′ W. Marker is near Lolo, Montana, in Missoula County. Marker is at the intersection of U.S. 93 and Delarka Drive, on the right when traveling south on U.S. 93. Touch for map. 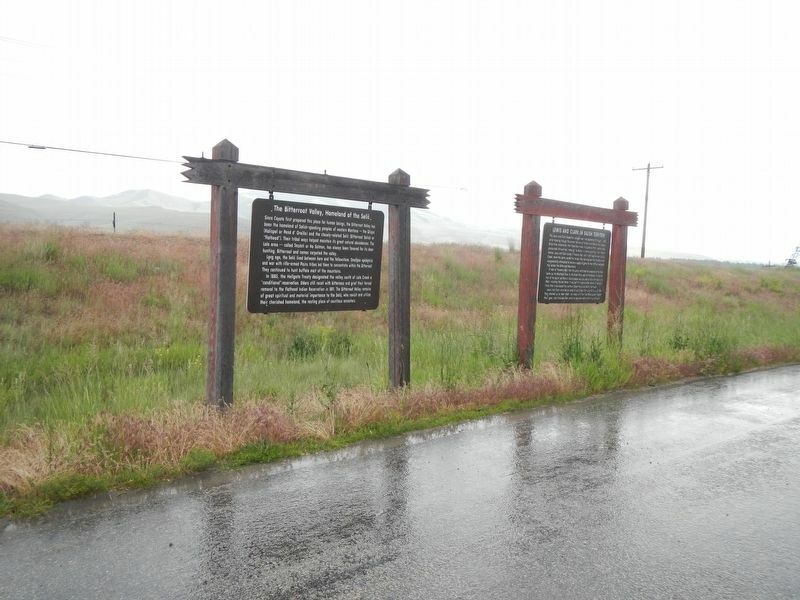 Marker is at or near this postal address: 13498 U.S. Highway 93, Lolo MT 59847, United States of America. Touch for directions. Other nearby markers. At least 8 other markers are within 5 miles of this marker, measured as the crow flies. Lewis and Clark in Salish Territory (here, next to this marker); Uncovering the Expedition (approx. 0.6 miles away); Following Formation (approx. 0.6 miles away); The Journey Home (approx. 0.7 miles away); Travellers Rest (approx. 0.8 miles away); A Crossroads of Culture (approx. 0.8 miles away); The Lolo Trail (approx. 1.1 miles away); Lewis and Clark on Lolo Creek (approx. 4.3 miles away). Touch for a list and map of all markers in Lolo. More. Search the internet for Bitterroot Valley, Homeland of the Selíš. Credits. This page was last revised on September 17, 2018. This page originally submitted on September 17, 2018, by Barry Swackhamer of San Jose, California. This page has been viewed 33 times since then and 6 times this year. Photos: 1, 2. submitted on September 17, 2018, by Barry Swackhamer of San Jose, California.